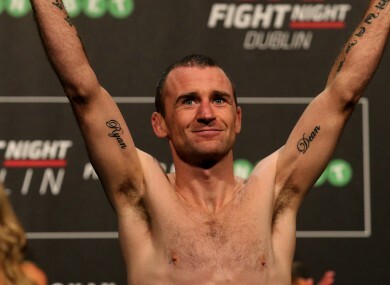 Irish UFC flyweight Neil Seery. NEIL SEERY IS probably in a better position than anyone else to comment on the main event at UFC Fight Night 76. The final bout of the night for the UFC’s return to Dublin’s 3Arena will be a flyweight contest between Louis Smolka and Ireland’s Paddy Holohan. Seery, who represents Team Ryano in Finglas, regularly spars with Straight Blast Gym’s Holohan, and his last fight was a unanimous-decision defeat to Smolka in July. In spite of his inside knowledge of both fighters, however, Seery is unable to predict who’ll emerge victorious from tomorrow night’s three-round headliner. “I think it’s a good main event. I would have liked five rounds instead of three,” said Seery, who also features on the UFC Dublin main card against Jon Delos Reyes. “I think there’s going to be really high-level grappling exchanges. I think game-plan is key. Louis Smolka has proven that he can change it up. He can stand and finish people on the feet. Seery also dismissed any notions of what may have been from his own point of view. Had he been victorious against Smolka at UFC 189, would the veteran Irishman have been in contention to fill the main-event slot which was vacated by Joseph Duffy and Dustin Poirier? As for his own fight tomorrow night, Seery is eager to return to winning ways. However, equally as important in his mind is putting on a show for the fans — which he has never failed to do so far. Email “A fighter who knows them both well 'can't pick a winner' between Holohan and Smolka”. Feedback on “A fighter who knows them both well 'can't pick a winner' between Holohan and Smolka”.